It's a little known fact that the world famous Baker Street was given this name because once upon a time there was a lot of baking establishments situated in this part of London. Yeah, pal! I'm not burning your crusts! If you don't believe me, why don't you check out the following 96 minute movie made in 1993? It was Directed by: Kenneth Johnson; and Starred: Anthony Higgins, Debrah Farentino, with Ken Pogue. You listen here, Mister Sherlock Holmes (Anthony Higgins). When I first met you, you were nothing more than a cryogenically frozen lunatic camped out within Mrs. Hudson's (Joy Coghill) cellar. And now, after I've nursed you back to health, as well as got you better acquainted with twentieth century society, you're seriously trying to tell me that you want to tackle two distinct crimes at the very same time? But come off it, man. Which crime do you sincerely want to scope out first? Would you like to figure out why two Bengali tigers' are mauling people within the vicinity? Or would you prefer to track down and append Professor Moriarty's great-great Grandson, James Booth (Ken Pogue)? Or better yet, would you enjoy having an impromptu argument with you're truly -- where I throw you out onto the street so you can meet the local tramp -- only for me to eventually come to the realization that you are, who you say you are, and, blah-blah-blah? Oh! You'd like to do all three, would you? Fair enough, Sherlock. Then again, that's most probably why what next transpires all comes into play when you say to me, 'Please put on some clothes, Doctor Winslow (Debrah Farentino), cause the game is a foot!'. As a Victorian identity is thrown in the fire - our pal Zapper (Mark Adair-Rios) helps out with a plot most dire -- two bad guys come across like two ugly gnomes - and at the end of the day, please remember my friends, there's no place like Holmes. You know how you can sometimes enjoy a particular something yet loath it for the very same reason? 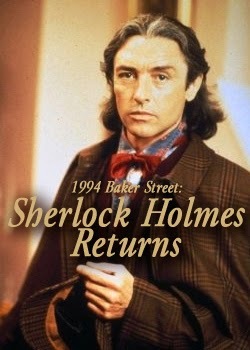 Well folks, in no uncertain terms that's precisely what I felt about watching 'Sherlock Holmes Returns'. Even though I did enjoy watching quite a lot of this film, in the same breath I wasn't completely blown over by it either. Now a good example of this would be how I enjoyed listening to Sherlock's frequently calculated deductions, even though they somehow broke up the momentum of the overall plot. Plus, to a certain extent, I can say exactly the same thing about liking -- yet hating -- how this 'fish out of water' type scenario seemed overtly obvious in its execution. You see, from a purely creative point of view, as much as I adore this type of premise, and will always enjoy following characters in unfamiliar surroundings, I'd still prefer it if the narrative tried to do something more original and less predictable with those involved. Honestly, dear readers. From the very start of this film I actually second guessed that Sherlock would have some difficulty with the 20th century plus the people he encountered. And in addition to this, I also second guessed that he would overcome these challenges one way or another, whilst simultaneously winning favor with whomever the plot dictated. Granted, there were a few occasions where this movie was more congenial with this naive stance. Like when Sherlock tried to speak 'street talk' for instance. Or when the Winslow character made a pass at Sherlock during that snake scene! But then again there were also those instances where the flow of the premise felt very disjointed within its multi-stranded structure. One moment it concentrated on the Moriarty part of the tale. The next moment it concentrated on the tiger part of the tale. And the moment after that it concentrated on the Zapper part of the tale. Whilst trying its best to also re-establish Sherlock Holmes presence within the plot, set-up the tone, and yadda-yadda-yadda! There. Can you see what I mean now folk? About this production being good and bad at the same time! I hope so. Or otherwise you wouldn't be able to keep up with the following filmic-facts, Ha! (1) The 'CBS television network' first broadcast this production in America on the exact same day the satellite 'Discovery' first launched into Earths orbit. It was on the 12th of September, 1993. (2) The majority of this movie was shot at 'North Shore Studios', Canada, plus throughout numerous parts of San Francisco and British Columbia. (3) Kenneth Johnson, who directed and adapted this adventure for the small screen, is best known for producing and co-writing two popular television series: 'The Incredible Hulk' and 'V'. 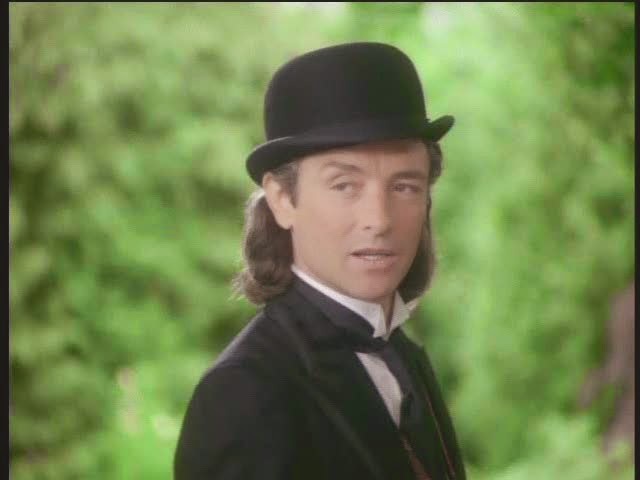 (4) Despite playing Sherlock in this flick, Anthony Higgins also played Professor Moriarty in a 1985 spin-off, called, 'Young Sherlock Holmes'. 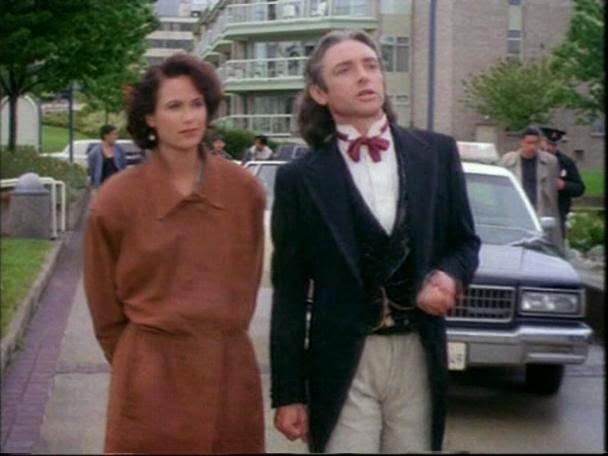 (5) This TV movie was loosely based on a 1987 TV movie starring Michael Pennington -- also entitled 'The Return of Sherlock Holmes' -- and in turn this subsequent production was then very loosely based on the Sir Arthur Conan Doyle 1890 classic, 'The Sign of Four'. (6) Sherlock regrettably makes one factual error in that scene where he explains to Doctor Winslow who chronicled his famous exploits. No, Sherl. Conan Doyle is in fact a Scottish man and not an Irishman. Tut-tut-tut! You should know better! (7) The actor who played Zapper in this flick, Mark Adair-Rios, began his career starring in a television commercial for Coke. (8) After this adventure went back to bed, Anthony Higgins starred in the comedy, 'For Love or Money'; Debrah Farentino starred in the crime-thriller, 'Malice'; and Ken Pogue starred in the TV series, 'Cobra'. 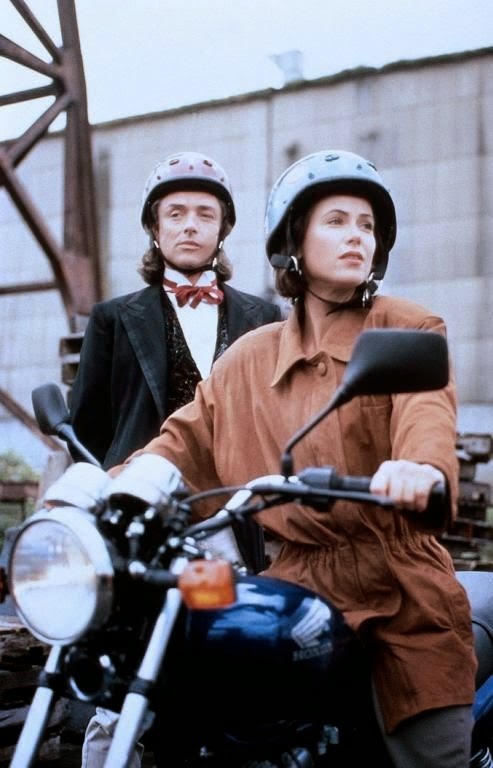 Now before I bugger off to Baker Street, I best mention that I did like Anthony's portrayal of Holmes plus his onscreen chemistry with Debrah's version of Watson. Although in hindsight this partnerships was kind of obvious in execution, whilst the villains weren't that villainous either. Still. Never mind, eh? At the end of the day I'd say 'The Return Of Sherlock Holmes' was one of those movie which had a great concept behind it, a predictable tone, yet couldn't actually handle too many things going on at once.